Of all the many food products made from cocoa beans, chocolate ranks right up there as one of the most favorite treats enjoyed the world over. And everyone knows that chocolate is the gift to give for Valentine’s Day as the sweet treat symbolizes love and affection. Dark chocolate tastes somewhat bitter, making it less popular than milk chocolate. However, when it comes to health, the dark variety is preferable over the lighter types that contain lots of sugar and other additives. Below are a few ways dark chocolate benefits the skin. 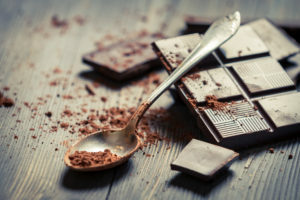 Once eaten, “good” microbes in the gut ferment the chocolate into anti-inflammatory compounds that are absorbed into the body, lessening inflammation throughout the body, including the skin. The European Journal of Nutrition found that consistently eating dark chocolate for 12 weeks significantly reduces moisture loss in the skin, resulting in fewer sunburns. This is because the high cocoa levels in dark chocolate boost blood circulation to the skin capillaries, helping them draw in more oxygen and nutrients to protect the skin against the harmful effects of UV rays. Dark chocolate contains important minerals like iron, zinc and copper which promote skin cell growth. Regularly eating small amounts of dark chocolate can help with common skin conditions like eczema and acne. The antioxidants present in dark chocolate protect the skin from the damaging effects of free radicals to keep the skin soft and supple. Just eating one ounce of dark chocolate every day that contains at least 70% cocoa can keep the skin smooth, hydrated and free of blemishes and breakouts. If you plan on incorporating dark chocolate into your daily diet to help you achieve clearer, softer and healthier skin, be sure to choose high quality dark chocolate with 70% or higher cocoa content and to only eat 1 to 2 ounces a day.